As a kid, I was not crazy about vegetables - tomatoes, peas, spinach, and broccoli were all on my list to avoid. 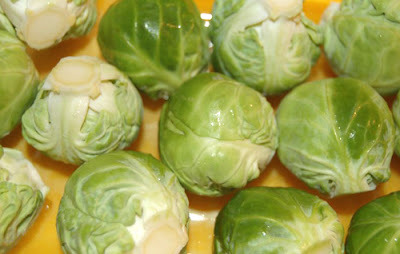 But I always liked brussel sprouts, for some reason. I bought a bunch of the darling mini-cabbages at the farmers' market last week. I was trawling through the internet for a good, easy way to prepare them when I found this wonderfully simple recipe from The Barefoot Contessa Cookbook. It is remarkably easy and delightfully tasty. I have not included any amounts as it's simple enough to adapt to however much or little you want to prepare - just use enough oil to coat the sprouts on all sides. 2. Toss the sprouts with the olive oil, salt, and pepper, and spread them in a single layer on a baking sheet or in a baking dish. 3. Roast for 45-50 minutes, turning them every 15-20 minutes. I've made them the same way, and they are indeed delicious! (I've also really gotten into roasting broccoli this way, for a different flavor than just steamed or stir-fried). Roasted brussel sprouts are wonderful. I like to toss them with some nuts (pecans, split hazelnuts or slivered almonds are best) and a drizzle of maple syrup after roasting - it's a wonderful flavour combination. I've been halving them and pan-roasting them with olive oil, kposher salt and garlic, in a cast-iron pan, covered. They brown a bit, which is great, and are done in 20 minutes tops.